I just can't wait to see this again on Monday night! This was my third open house at the Met. Although the house didn't seem "sold out" today, the audience of all ages, including several school groups, was enthusiastic and appreciative. 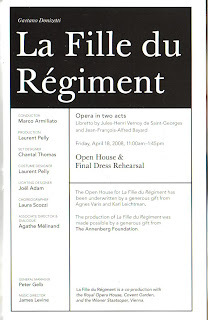 Natalie Dessay, Juan Diego Florez, Felicity Palmer, Donald Maxwell, Alessandro Corbelli and Marian Seldes were all fabulous, outstanding in acting and in singing. I don't think I've ever heard Dessay or Florez sound quite so good and oh my, they are funny. I loved Felicity Palmer and her piano playing as she accompanied Natalie's singing on stage was a riot. Marian was a stitch in her tiny role as the Duchess. She had two costume changes and was elegantly turned out in shades of lavender and purple, naturally her signature color. I ran into various friends which is always a treat in this huge city. I do love like-minded friends. Sally and I were in parterre seats for the first time. It was luxurious, but really not all it was cracked up to be - we had to struggle to see over tall people in front of us and be comfortable in the cramped box, plus I could not see the brass section of the pit. Alas, there were no tiny finger sandwiches and cookies today, so Sally, Kevin and I gladly gobbled up lunch and beers at the Old Stand By after. It was beautiful day inside and out of the Met today, indeed a perfect day to play hookie.